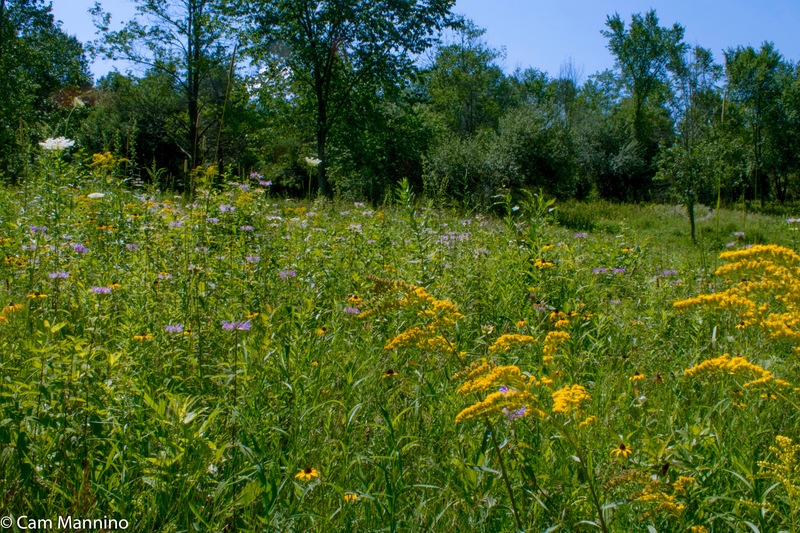 Watershed Ridge Park: Restoration Off to a Colorful Start! 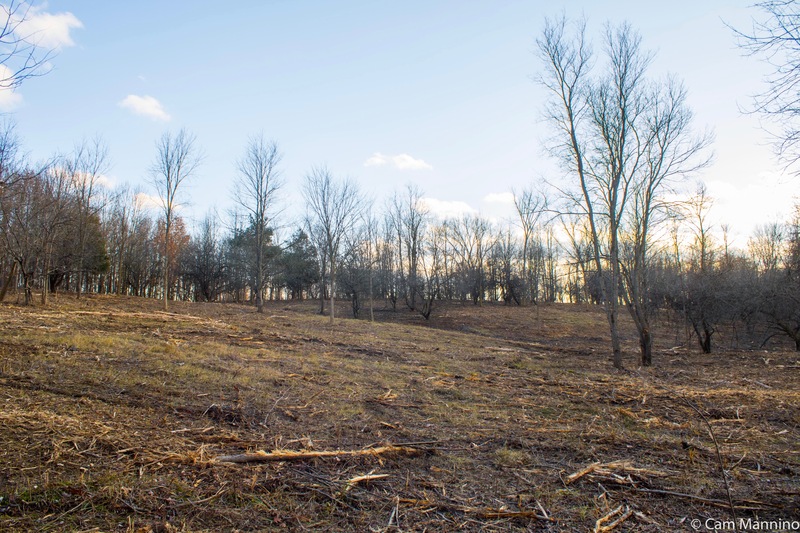 But last fall, our Natural Areas Stewardship Manager, Ben VanderWeide, began removing an almost impenetrable cover of invasive bushes that had taken over part of this beautiful piece of land. And suddenly, the graceful contours of the land came into view. The rolling slopes looked lifeless then. But what a transformation this spring and summer as sun finally reached the native wildflowers! 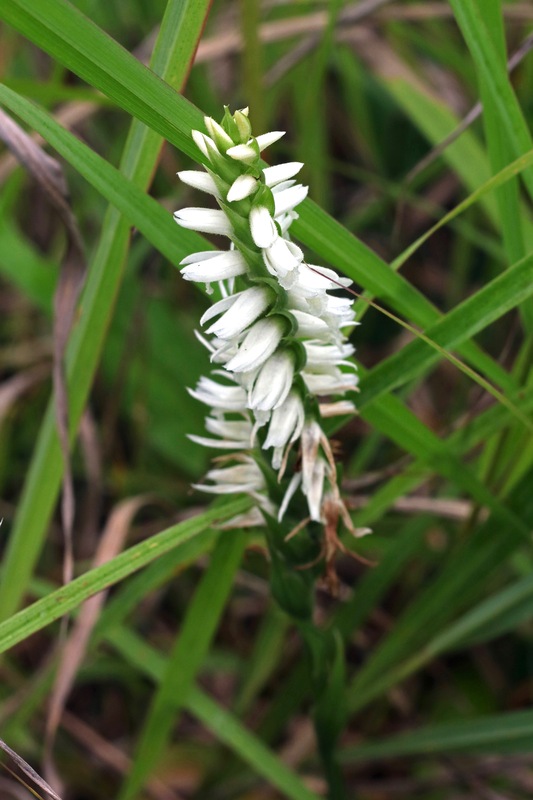 Ladies Tresses, a small orchid, is a fall wildflower that Ben saw at Watershed Ridge last autumn. Right now I’d advise anyone to be cautious about walking through Watershed Ridge since it’s easy to get disoriented on 170 acres without trails (though a compass in your phone helps, I find!). Hikers need to use the edges of the farm fields so that they don’t damage the crops. The woody debris on the ground makes walking a bit tricky and there’s a fair amount of Poison-ivy (Toxicodendron radicans) to avoid. Photos below might help those afraid of all 3-three-leaved plants. The one on the left is poison ivy. Note the “thumb” on the leaves which is missing from other three-leaved plants like the Black Raspberry (Rubus occidentalis) on the right. Poison-ivy often has reddish “feet” when it’s climbing a tree and grows along the trunk rather than around it. Poison-ivy has a “thumb” on at least some of its three leaves and grows along tree trunks, rather than around them. So for now, perhaps consider an easier alternative. Join me on a virtual walk from the entrance area with its busy young birds, into the forest with its woodland flowers and wetlands and beyond the woods to the meadow with a riot of native wildflowers, butterflies, an exotic moth and more! The best spot to park is on Buell Road at the firewood pickup site (1650 W. Buell Road is the approximate address – click here for a map). Just to the west you’ll see a work area for Parks and Recreation staff that includes a pole barn and bulk materials storage. This work area is closed to the public, but you’re welcome to explore the rest of the park. 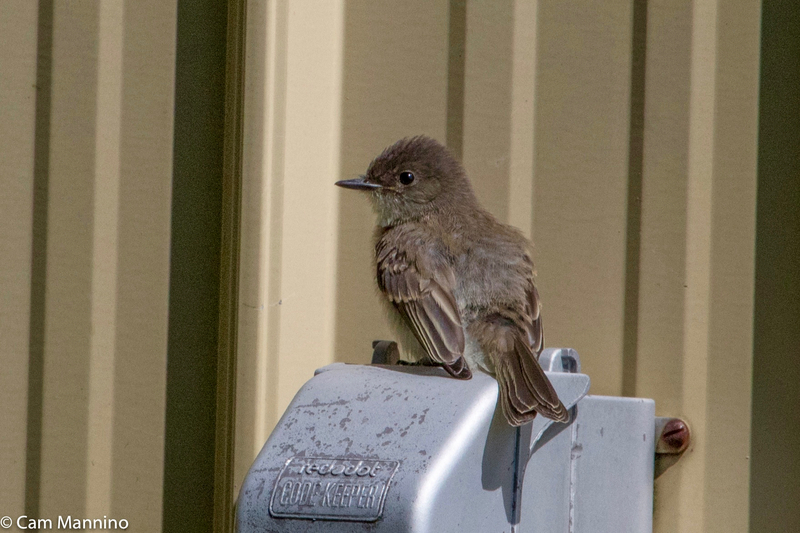 A young Eastern Phoebe (Sayornis phoebe), however, was off on its own, trying out its wings, exploring the pole barn (sheds are popular Phoebe nest sites) and flying down into the grass like any adult Phoebe might. A young Phoebe exploring the shed at Watershed Ridge – a very typical behavior for a bird that often builds nests in human structures. 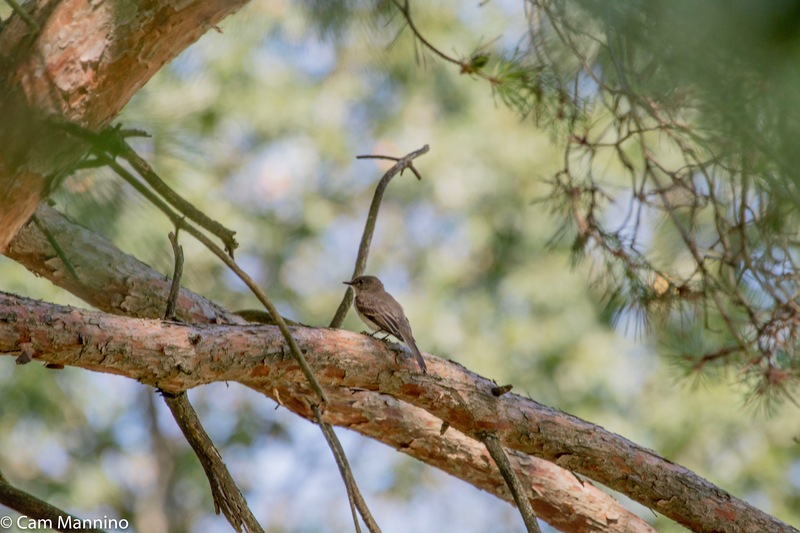 The same Phoebe in a nearby tree to provide a glimpse of how small this little flycatcher is! A young Downy Woodpecker (Picoides pubescens) was also off on its own and looking a bit dubious about what to do next as it sat in a nearby pine. This may be a young male since it appears that its juvenile red cap is slowly receding into the red spot that a male sports on the back of its head. 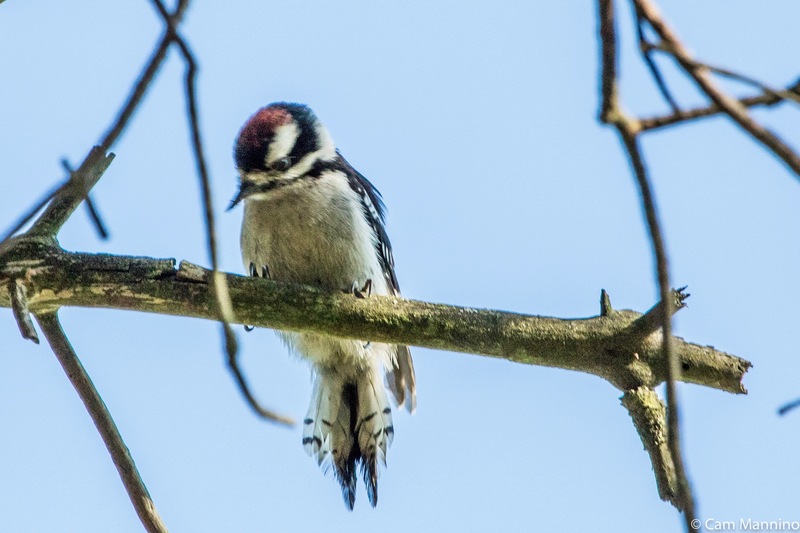 A juvenile Downy Woodpecker considers what to do next. I failed to get decent photos, but two weeks ago, a pair of Cedar Waxwings (Bombycilla cedrorum) were still feeding their nestlings, flying back and forth between a tree on the west side of the area to a large willow on the east where they probably were foraging for insects before returning to the nest. Here are two not-so-hot photos! From mid-July to mid-August, American Goldfinches (Spinus tristis) raise their young. Unlike most native birds, they wait until mid-summer to breed, because they like to line their nests with thistle down, eat the seeds themselves and feed them to their young. Several were flitting among the thistles along Buell Road. 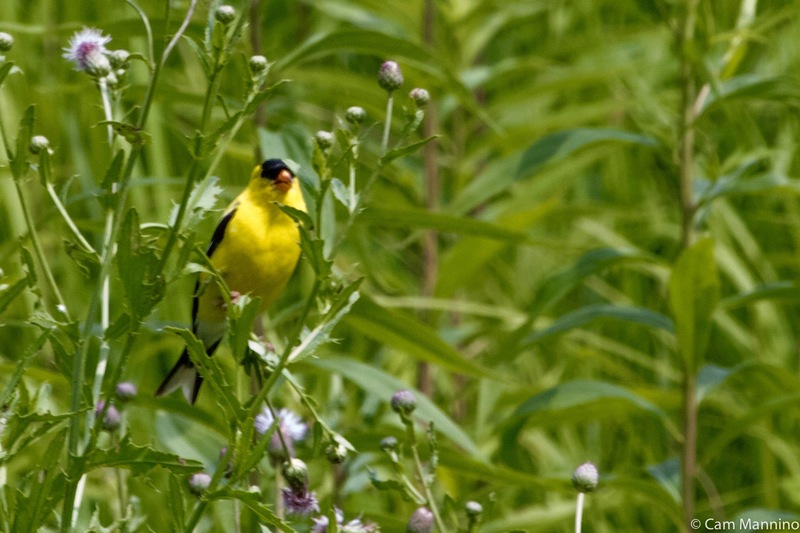 American Goldfinches like thistle down for their nests and the seed for feeding themselves and their young. 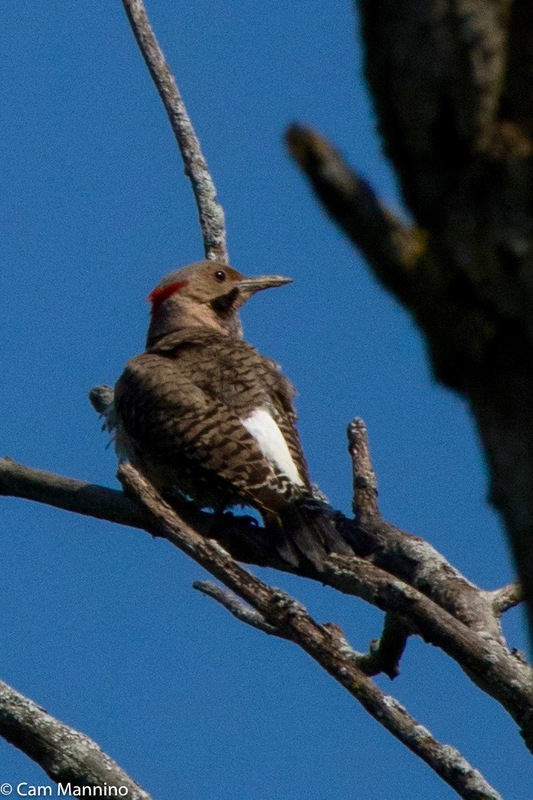 A male Northern Flicker with his dashing “mustache” perused the territory from the top of a snag. A “High Quality” Woodland Sprinkled with Wildflowers that Love Moisture, Shade and Rich Humus. 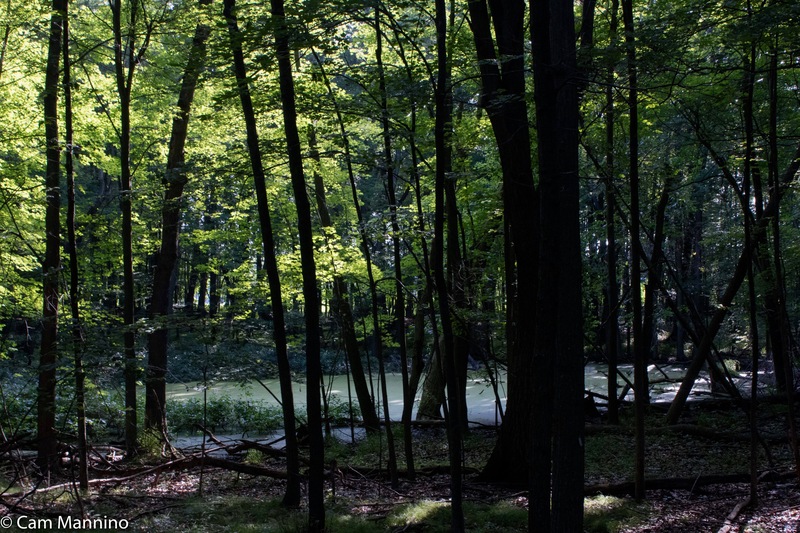 When you step into the cool darkness of the woods on a warm summer afternoon, you notice that most of the plants bear modest little flowers compared to sunnier areas. Perhaps that’s because they’ve evolved growth and reproductive strategies that are different from the large, colorful blooms of a sunny meadow or prairie. One good example is the unusual flower of a parasitic plant (not a mushroom!) that Ben helped me find, called Indian Pipe (Monotropa uniflora). This small, white wildflower typically grows in forests and lives on the photosynthesis of trees – especially oaks in our area – by tapping into the mycorrhizal fungi that connect the trees below the soil. As a result, it doesn’t use photosynthesis and contains no chlorophyll. 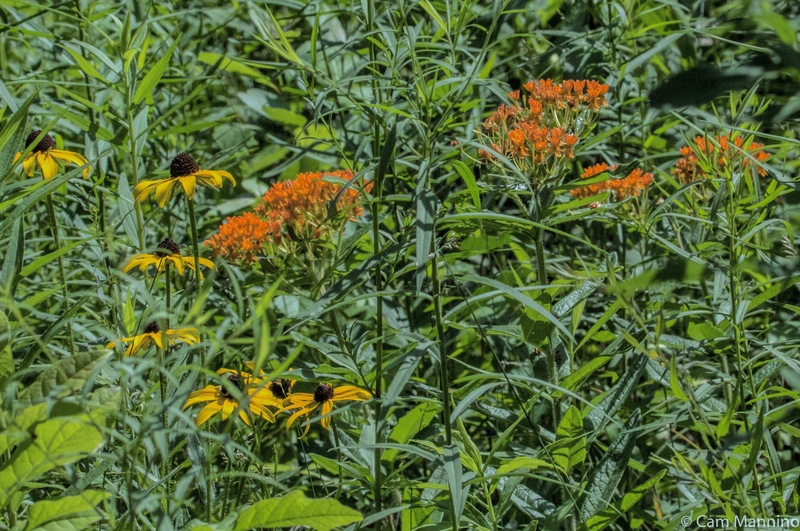 According to the Illinois Wildflower website (a descriptive floral site), “This unusual wildflower is normally found in high quality woodlands” where there is “abundant humus.” Hooray for Watershed Ridge, eh? A wildflower that lives by tapping into mycorrhizal fungi beneath oak trees. Indian Pipe (a wildflower not a mushroom) does look like its name. The modest blooms of summer woodland plants primarily attract small bees, like sweat or carpenter bees, or flies, rather than honeybees or bumblebees. They also frequently spread by rhizomes (underground stems) and/or by making bur-like fruits that will stick to any passing animal, including you! Tall Agrimony (Agrimonia gryposepala), a woodland member of the Rose family! Wildflowers that enjoy dappled light find a home where the woods meets the now-open meadow. Heal-all (Prunella vulgaris) was once though to do just that! Native Americans used mashed Jewel-weed (Impatiens capensis) leaves to reduce skin rashes including poison ivy. Naturally, mushrooms also thrive in shady, moist places. Near the edge of the woods, I saw what I think are two kinds of highly toxic mushrooms from the genus Amanita. I believe they are either Amanita phalloides or Amanita bisporigera. In any case, Amanita mushrooms are also called “death caps” for good reason – so admire their exotic strangeness, but leave them right where they are. The yellow one may have been nibbled by squirrels or rabbits who can eat the toxins with no problem. The trees we know and love today appeared on the earth about 24,000 years ago. A colony of what I think are from the mushroom genus Agaricus. A closeup of a few mushrooms in case you can ID them! Ben saw two snappers on a log in one of these woodland pools, but they dove in before I saw them. I did see some of my favorite frogs, though. A small female Green Frog (Rana clamitans) (left) basked on a fallen log, while a male nearby (right) did the same. In the female, the tympanum (circle behind the eye used for hearing) is about the size of her eye; the male’s tympanum is about twice the size of his eye and he has a yellow throat. At the eastern pool, a tiny, black-masked Wood Frog (Rana sylvatica), perhaps 1/2 inch long, paused for its photo on a leaf. This one’s back and legs are bright green, perhaps from the Water Meal (Wolffia columbiana) or the algae in the pool nearby. It seemed an odd time of year to find an early spring frog, but Wikipedia says that occasionally Wood Frogs do breed more than once per year. Maybe the heavy rains contributed to more water and hence more breeding behavior? Just a guess. 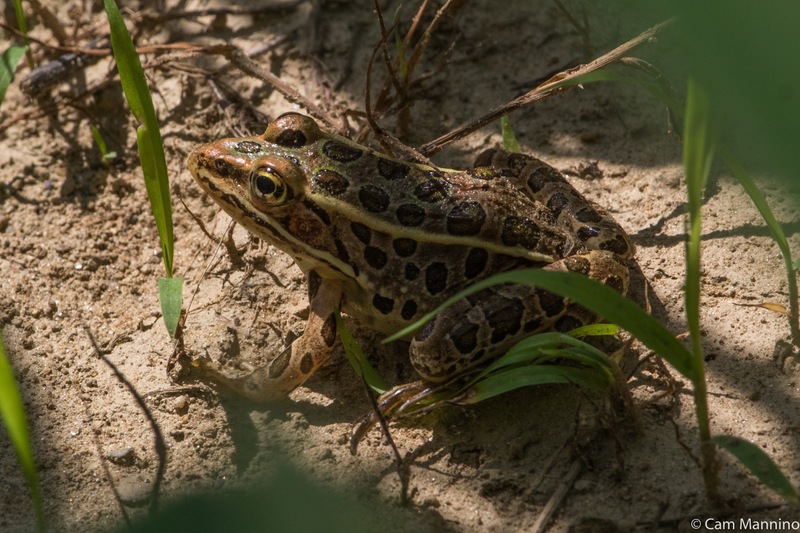 At the edge of the soybean field just beyond the wood, every step scared up hundreds of small Northern Leopard Frogs (Rana pipiens). They sprang out of moist grass and huddled beneath the bean plants. These young frogs take about 70-110 days to develop after the females lay their eggs in the water between May to June. 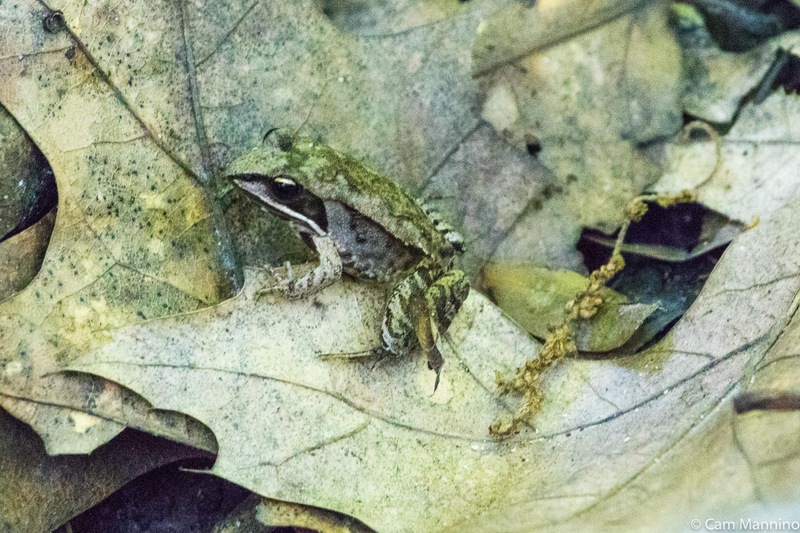 At about 2 inches long, they’re half the size of a mature Leopard Frog. Their numbers have generally been in decline since the 1970’s so what a delight to see so many of them here in the township on a protected piece of land! A small (about 2 inch) Leopard Frog, among hundreds that sprang out of the tall grass into the bean field a few weeks ago. And with the wildflowers, of course, come the butterflies – but first, one glorious moth! When I first spotted this unusual creature, I thought it must be some sort of bumblebee. But no, it’s the Snowberry Clearwing Moth (Hemaris diffinis). It has fewer central scales on its wings than other butterflies or moths so the wings appear clear in places. It’s odd shape and hovering flight have also inspired the names “the hummingbird moth” (not to be confused with the European one of the same name, Wikipedia tells me!) or the “flying lobster!” A new creature for me! This is not a bumblebee. It’s a Snowberry Clearwing Moth mimicking one! 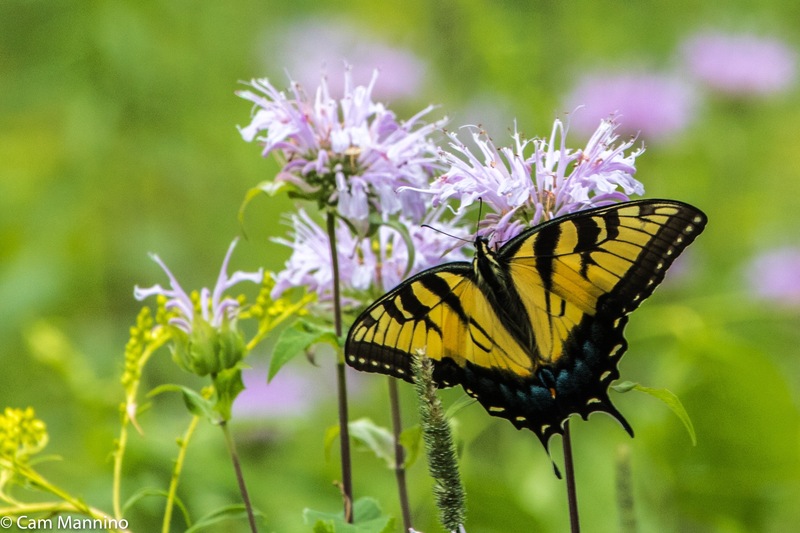 On my first summer visit with Ben, we saw a glorious Eastern Tiger Swallowtail (Papilio glaucus) sipping from some of the bee balm which emerged in great waves of color across the restored meadow this summer. What a sight! A female Eastern Tiger Swallowtail sips nectar from the great swath of bee balm that now flows across the restored meadow. Having seen the Spicebush Swallowtail butterfly (Papilio troilus) for the first time at Charles Ilsley Park a few weeks ago, I saw another male at Watershed Ridge. The clue is the wash of blue scaling on the wings. A week later I saw another one near the shed which was either the female, which has a less intense wash of blue scaling, or a tattered male who had already lost some of his scales. That Spicebush continually tried to chase off a female Monarch (Danaus plexippus) who was patrolling the same patch of flowers last weekend. The scales on her wings looked quite worn as well. Perhaps they’d worn each other out with all that chasing! I saw some fritillaries dancing together at a distance but not close enough for a shot. But the little Orange Sulphur (Colias eurytheme) was kind enough to pose for a few moments. The meadow slopes down to a sunny wetland that is probably fed by the creek running through the trees just east of the meadow. The stream bottom is bright orange, most likely a result of iron deposits in the soil. I loved how the sky was caught in the water’s surface as I looked upstream. The creek bottom was orange probably from iron in the soil. The resulting wetland at the meadow’s edge featured flowers that love “wet feet,” like Joe Pye Weed (Eutrochium maculatum) and Boneset (Eupatorium perfoliatum). With a wetland nearby, dragonflies, flying predators, swooped across the meadow on the hunt for other insects. Witnessing the dramatic renewal that takes place when invasive shrubs are removed from park land is simply inspirational. What else, who else might return to this lovely piece of land once the Parks and Recreation Commission has time and the funds to develop this 170 acres? What seeds are waiting in the seed bank for their turn in the sun – perhaps even this autumn when the asters in their varied lavender-to-purple blooms or other autumn wildflowers rise from the earth? 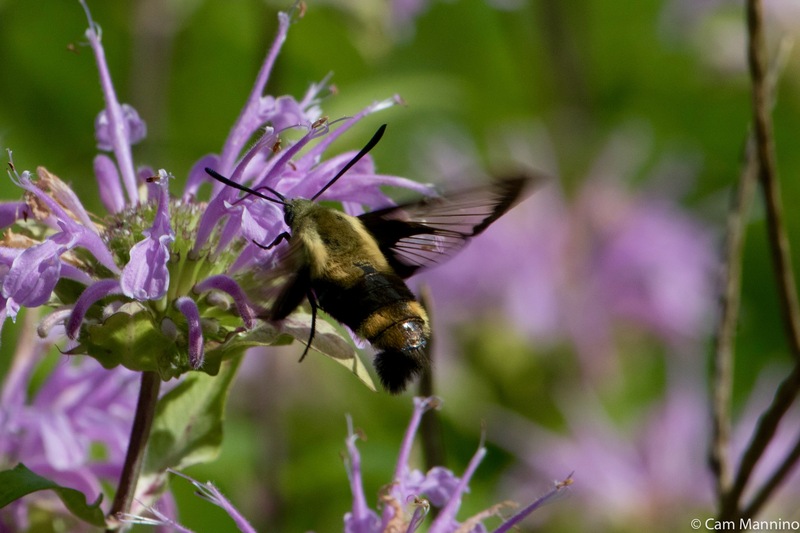 What other exotic creatures like the Snowberry Clearwing Moth might be sipping at future flowers? What birds might return to nest here? 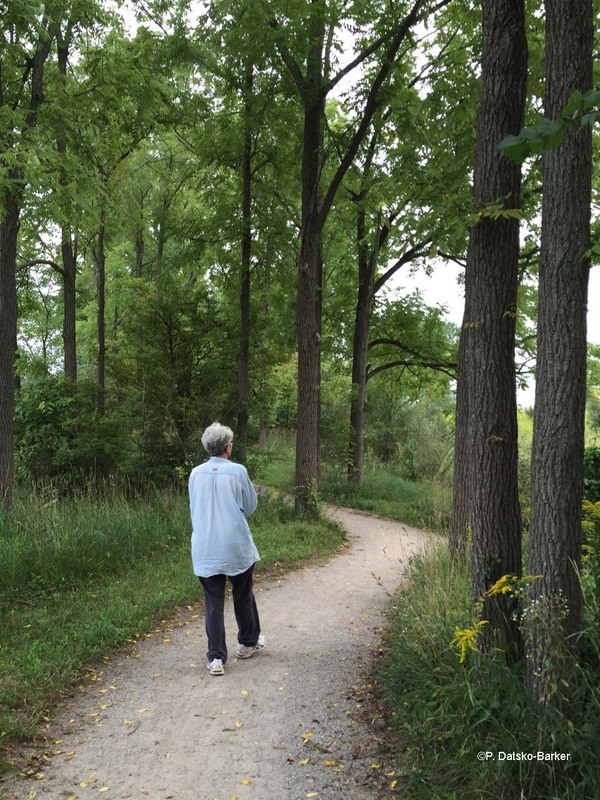 The possibilities are endless as the Ben and the Parks Commission work to renew the diversity of life which is our township’s natural heritage. So much to look forward to as this park progresses over the next several years! Cam, Thanks for another wonderful post!